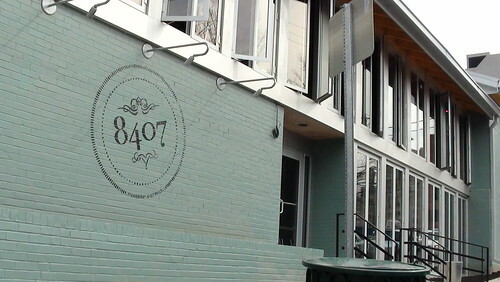 just up the pike: it's been a while since someone called silver spring "gentrified"
it's been a while since someone called silver spring "gentrified"
People are raving on the neighborhood listservs about 8407, the new kitchen and bar at 8407 Ramsey Avenue. "The atmosphere was great, food was good," writes one diner. Another enjoyed "watching the construction" of the Silver Spring Transit Center across the street. "We need to keep this place open!" a third concludes. The old Luau Hut in Silver Spring, which was really a terrible eyesore and wasn’t ever as cool as all the nostalgia fucks like to pretend, has now been replaced by the 8407 Kitchen Bar or, as the gentrified Yankee-transplant so-called “locals” have dubbed it, the "Nicaro Hut," since it’s the offspring of the owner and chef of the former Nicaro. Over the next thirteen paragraphs, the writer - whose pseudonym is Nacho Sasha - complains that the restaurant is across the street from a construction site; that the cab drivers waiting outside are "feral"; that the bar stools are uncomfortable; that the bartenders are slow but the waitstaff perky enough to be "Stepford Servers"; that the beer list is too short and the food is "supermarket-level pre-packaged stuff warmed in a microwave," which he sends back with a promise that he'll never eat there again. This guy has the right to say what he wants, and to his credit he's got a couple of good things to say about 8407. But he still excoriates the one commenter who had the nerve to call him out for writing the place off on opening day while reminding us in a subsequent post that those who disagree with him are "transplants, ex-rubes, and neo-yuppies who, apparently, were either born in barns or without taste buds." So I can't take this review too seriously. After all, Nacho makes the observation that Downtown Silver Spring is "boring" and that there are too many chain restaurants, which would be funny if it wasn't so unoriginal or short-sighted. I can give a pass to pretentious D.C. hipsters who assume anything outside of H Street is too white-bread for them. But someone who claims to have lived here for years should know better, that is, if he's ever come out from behind the keyboard long enough to see that Silver Spring doesn't begin and end with Ellsworth Drive. Count Nacho in the "Silver Stink" camp - people who hate that Silver Spring has become a desirable place to live, but also grumbled about the lack of investment or activity here "back in the day." Of course, if this yuppie wonderland were so terrible, they would've packed their bags years ago. So let them complain while all of us "newcomers" enjoy our safe, fun, diverse downtown that's getting better every day. And I'll have to check out 8407 myself, as soon as I finish my Great Peruvian Taste Test. I was going to leave a comment on that site, but I decided to restrain myself. Sing it sista! Diversity includes yankee yuppy hippsters as much as everyone else. Wow, what a grump that guy is. Glad he'll be staying away from 8407. Your H street reference is a poor one because H street will suffer the same fate as downtown SS eventually. You can already see it with the trolley they’re putting in. (Necessary as there’s no Metro and spotty bus service.) But how long until there’s a Starbucks, a Gap store, and a million dollar nightclub owned by Clear Channel? I think I'm one of the reviews you quoted at the top of the article. 8407 is really good, in all categories. I don't get this guy's characterization of the cabbies as "feral". Good grief, they're people working for a living. Generally nice, too. I grew up down in the Oxon Hill/Camp Springs area and my folks still live there. Dad has always had an attitude that if people from outside of southern PG want to think it's scary or dangerous, let them. It keeps those people away and we can live a great quality of life with good prices. I feel the same way about Silver Spring. I've lived here over ten years now and walk all over DTSS day and night. It's funky, ethnic, and generally affordable. You can stand on a street corner and watch the world walk by. Nice people, too. The only time I've felt afraid here was during the DC Sniper weeks. I don't understand why that blogger would continue to live here. Like most "proud relics of the 60s," I did not turn into "gentry." Maybe there should be a bumber sticker that says something like, "I'm over 65 and I vote for skate parks." "I'm over 65 and I vote for skate parks." Do you also support additional funding for research into healing of broken hips? great response. your love of our 'hood (while embracing its imperfections) is always evident, and appreciated. same with sligo. and that's why i follow both your blogs and not nacho's. I'm a yankee transplant (albeit more than 12 years ago) and I think I might even be gentry, so I guess my opinion doesn't count, BUUUUUUT I think it's a bit silly to open a restaurant in this area without even one token vegetarian option (unless grilled olives are considered a meal in some parts of the world). The potato gnocchi with roasted wild mushrooms and parmesan coulis is 100% vegetarian and delicious.